Every once in awhile I come across a product I forgot I needed. Eggs have always been my most missed food as a vegan, initially because I knew the one edible that could one day sway me would be the French macaron, but then I worked out how to make vegan macarons. But what about eggy soldiers with marmite, the tastiest thing to hit Britain’s breakfast table since the crumpet? It’s a simple but comforting brekkie of soft boiled eggs and strips of buttered toast, though obviously in my case also slathered in marmite. The egg usually comes in an egg cup, the top knocked off, and served with a teaspoon to eat. 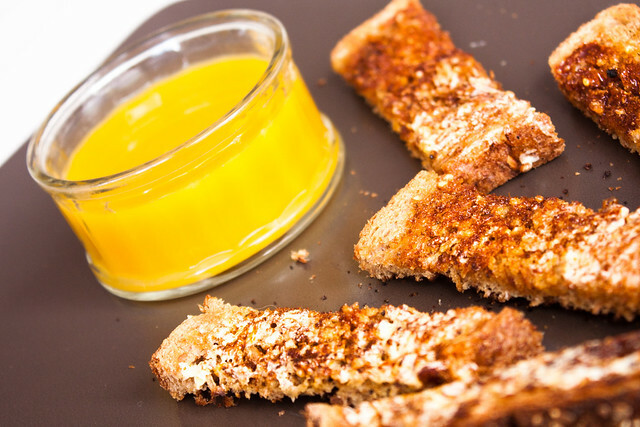 The toast is cut into strips (i.e. soldiers – I know, ridic) and these are dipped in the yolk. Alas, while I miss the flavour I do not miss the cruelty (and the simple fact of what an egg actually is), so that love was shelved. Then along came The Vegg. If you miss eggy soldiers then The Vegg is your solution. Really (based on a firm study of two people and a cat). Obviously it’s only a yolk replacement, but let’s face it – that’s where all the flavour comes from anyway. Toast and warm Vegg will change your life. I ate it for about 12 meals in a row. The other obvious dish was an omelette, for which I’ve included a recipe. The ingredients are minimal and it’s much softer than other versions of vegan omelettes I’ve made from cookbook recipes. As a result it’s also a little fussier, but I prefer the softness; just be careful with the handling is all. So far as fillings are concerned I used a mix of asparagus, tomato, onion, and seitan, all pre-grilled. You could use any number of fillings, however, so be creative! Blend all of the ingredients in a liquidiser or with an immersion blender. Heat a skillet (I used cast iron) to medium heat and add a teaspoon or two of oil to coat the pan. Pour half of the eggy liquid into the centre of the pan and use a spatula to spread it into a large circle (it won’t flow naturally on its own). Cook for five minutes (or thereabouts), or until most of the top side begins to dry out a bit. Pile your desired filling on one half of the omelette and fold the other half over. Press down ever so slightly with a spatula and leave to cook another minute or so before serving. Technically this is flip free because the omelette is mostly cooked by this point, but if you think it needs some time cooking on the other side then go for it! Serve warm with salad or with other breakfast items. Thanks for the great review, Kip! What a great idea! I am definitely going to try eating toasts with a small bowl of warm Veggs… sounds divine to me. I tried it and loved it. It’s so simple, but yet so good. I had it twice in a row. It’s good stuff, isn’t it? I’m a little bit obsessed. I’m at a loss as to how to soy-free this recipe. Any ideas? Hmm, good question. I’m not sure, to be honest. The tofu gives it a smooth texture, which you won’t get from any sort of flour. I’d be interested to hear if you think of anything though. Having said that, a friend just recommending using chickpea flour. Just tried this for the first time recently and am now addicted to veggy soldiers! Brilliant idea.